This giveaway is coming to you from the Boogadiers group of Saline Ambassadors! 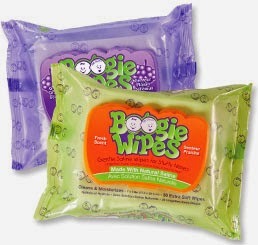 If you've never tried a Boogie Wipe, you should... they will save your kids' (and possibly your own) sleeves! Keep them handy in your purse, car, and stroller for all those yucky moments, and for some sticky moments too (they're great for after an ice cream cone)! And...in case you're curious, check out these facts about boogers! Up for grabs is two 30 count packages of Boogie wipes along with a handful (exact number not known-think of them as a bonus) of singles. Enter below! Yes we have and we love them...especially the grape scented ones!! I have not used this but would like to try them.